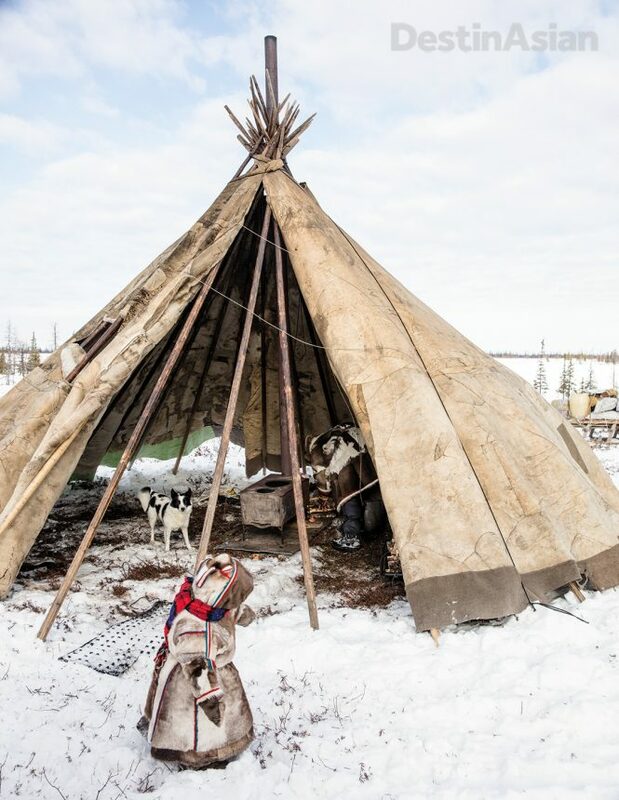 Few corners of the planet are as remote and unplugged as Russia’s Yamal-Nenets region, where a 10-day excursion with migrating reindeer herders gives adventure-seekers the chance to immerse themselves in a world far removed from the trappings — and distractions — of modern life. Migrating with the Nenets of Brigade 20 as they herd their reindeer across the frozen Gulf of Ob, a bay of the Arctic Ocean. Photo by Jen Judge. Smoke rises in twisted cords from a row of tepees on a snowy knoll. At the clatter of our approaching snow-mobiles, several women, round in thick furs, emerge into the last indigo smolder of the Arctic evening. When we stop and alight, they whisper to one another in a language I’ve never heard. Children flitter in the shadows behind them and point to us as if we’re ghosts. 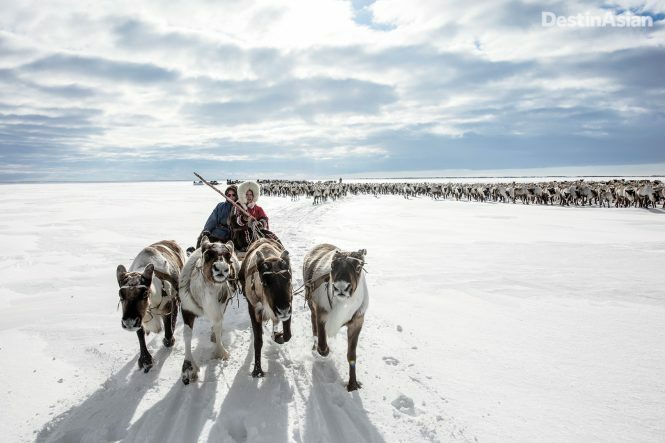 Yamal Peninsula and back each year in the constant pursuit of forage for their animals. We’ve caught up with them near their southernmost range, but before the spring melt they must traverse the frozen waters of the Gulf of Ob, a 50-kilometer-wide ice sheet that separates their winter and summer grounds. Our goal is to make the crossing with them. One of the 20 extended family members of Brigade 20. Photo by Jen Judge. Siberia in winter garners about as much tourist interest as, say, Death Valley in summer or Turkmenistan, well, anytime. Places of such climatic and geographic extremes are usually the realm of explorers, scientists, exiled dissidents, and the native peoples who are shrewd and hardy enough to inhabit them. Casual interlopers like myself are a rarity. Yet here I am with 12 other travelers on a bleak March evening just below the Arctic Circle, and we’re here largely because it is so remote and removed from the comforts and distractions of modern life. Wintering on the Siberian tundra requires warm clothes. Photo by Jen Judge. That first evening on the snowy knoll, with darkness closing in and temperatures sliding below minus 20°C, all of those elemental questions race through my mind. 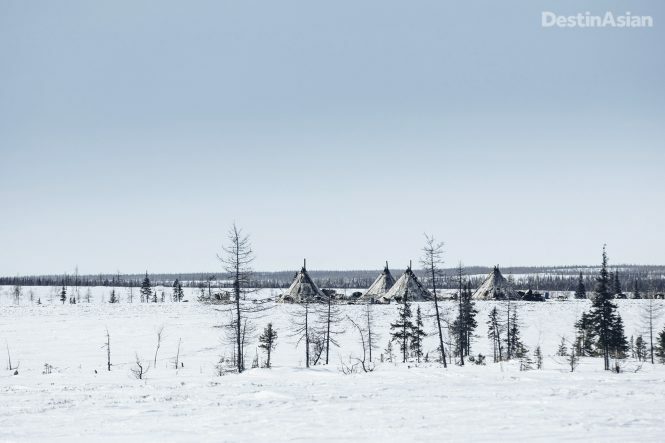 Nenets tents, or chum, are broken down and packed onto sledges every few days or so during the migration season. Photo by Jen Judge. Like most Nenets bands, Brigade 20 is a family unit, in this case consisting of four brothers, an uncle, a cousin, and all their kin and chaos—20 people in all. Secret Compass is paying each subset of the family a hosting commission to feed and accommodate us, and our group is quickly split among the brigade’s five reindeer-hide tepees, or chum. Along with my wife—photographer Jen Judge—and our translator Zhenya Levishar, I’m sent to chum number five, the home of the cousin, Alexey Khudi; his wife, Rosa Yaptik; and their three-year-old daughter, Marianna. Their three older children attend boarding school in Yar-Sale, the booming natural-gas town at the base of the Yamal Peninsula where we spent the previous night. 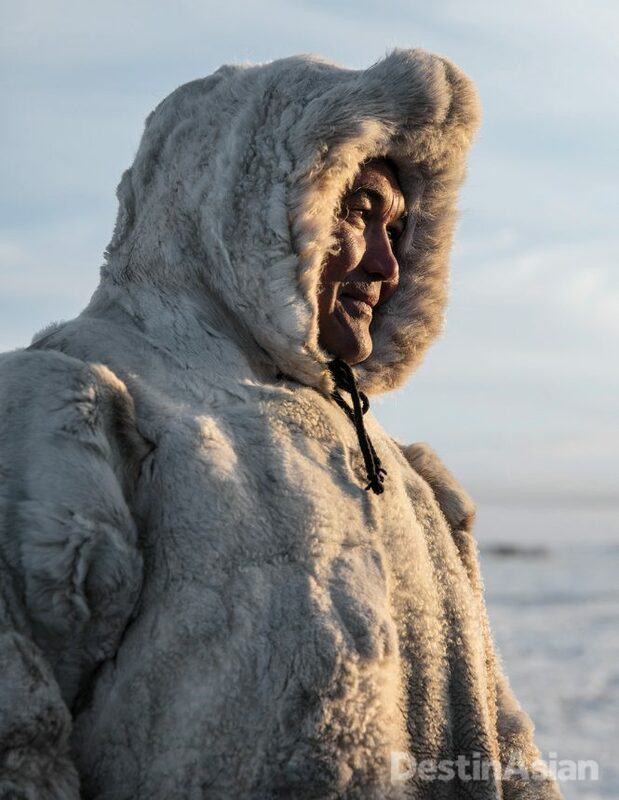 Nenets host Alexey Khudi. Photo by Jen Judge. In the language of the Nenets, yamal translates as “edge of the world,” and from the moment we follow Rosa through the darkness to her chum, that’s how it feels. For the next 10 days, I’ll stave off the cold wearing my host family’s hand-sewn furs, eat only what they eat—mostly uncooked reindeer and fish—and try to not get in the way. At night, we’ll lie shoulder to shoulder under shared furs like packed sardines. That all might sound more like boot camp than a winter break, but I’m keen to discover what lessons can be learned from emptiness and austerity. Besides, without the Nenets, I’d likely freeze to death on the tundra, so I’m happy for a place at their fire. Rosa draws back the reindeer-hide door flap of the chum and disappears inside. Then she pops back out. She repeats this once, twice, three times, methodically pulling the flap over her shoulder as she pivots: our first lesson in Nenets life is how to enter the tent without letting in the cold. But what’s really clear is that, out here, I’m as wide-eyed and helpless as an infant. From figuring out how to take care of hygiene issues discreetly while wearing 12 kilos of fur, to puzzling through arcane social rules—such as where you can and can’t put your feet inside the tent—everything is a bewilderment. A display of the aurora borealis above camp one night during the ob migration. Photo by Jen Judge. 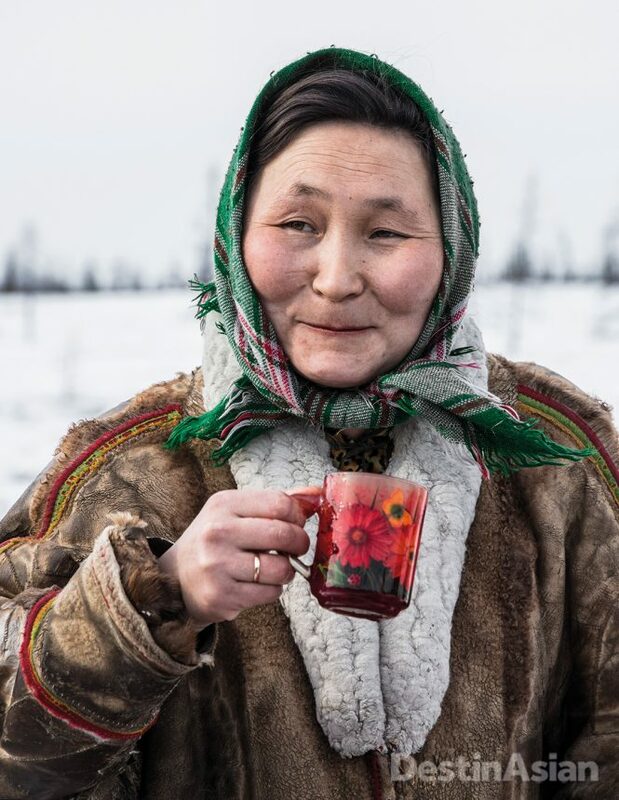 Alexey’s wife, Rosa Yaptik, drinking warm reindeer blood. Photo by Jen Judge. This is a reasonable question. Life on the tundra is ceaseless work, and to shirk the most basic tasks for even a few hours, such as tending to the fire, could mean ruin. Alexey and Rosa make it clear they want us to help with chores. They don’t need our help, they just don’t know what else to do with us. Rosa shows me how to use what looks like a whaling harpoon to chip aquamarine ice slabs from a nearby pond and lug them home for meltwater. Snow must be shoveled daily in drifts around the chum to buttress its walls and keep out the wind. And Alexey leaves me piles of deadwood to split. I’m terrible at it, like the golfer who scrunches his eyes and swings too hard. Rosa shakes her head and shows me over and over how to aim the ax. I can’t get it right, but with daytime temperatures often well below zero and nowhere to go but the chum, I’m grateful for something to do outside that keeps me warm. And even if I chop wood poorly, I start to appreciate the meditative quality of the work. It’s the anti-thesis of my frenetic life back home. A camp in the tundra. Photo by Jen Judge. As the days go by, teatime is the only thing more frequent than chores. 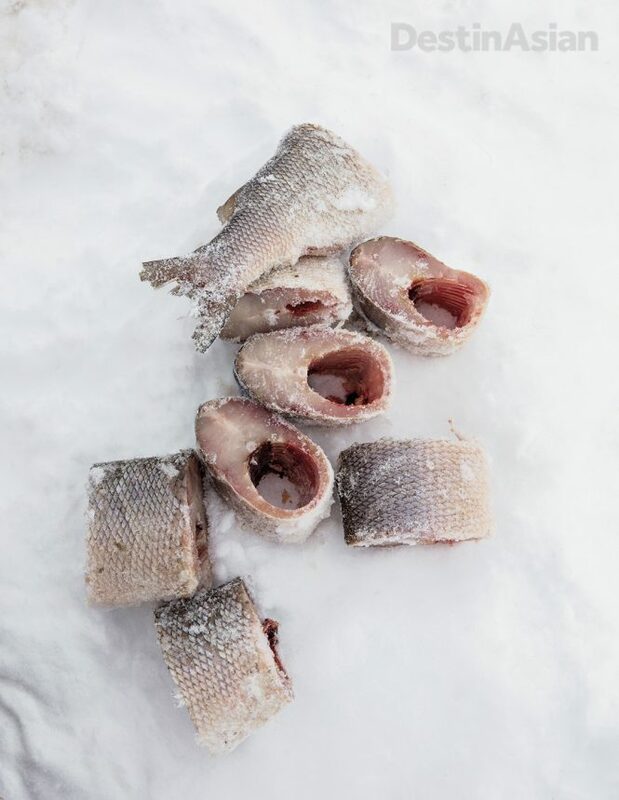 Nenets rarely eat full meals, instead sitting five or more times a day for small portions of whitefish (usually muksun or cisco) served in frozen hunks that you dice from the bone. Occasionally there’s reindeer meat, also served frozen or raw, as well as thick slices of crusty, processed bread, which you slather with butter and sprinkle with sugar. Then comes chai—black tea with sugar or sweetened condensed milk. Rosa shows us how to pour it from the demitasse into the saucer to cool, then slurp. During these break times we start to get to know our family. Overall, Nenets are about as gregarious as deadwood, and Rosa and Alexey are as spare and severe as their environment. But I occasionally catch them looking warmly at one another. The couple is also stern with three-year-old Marianna, who blunders around camp as clumsily as a baby seal in her puff of furs. Reindeer stew cooking on Rosa’s stove. Photo by Jen Judge. 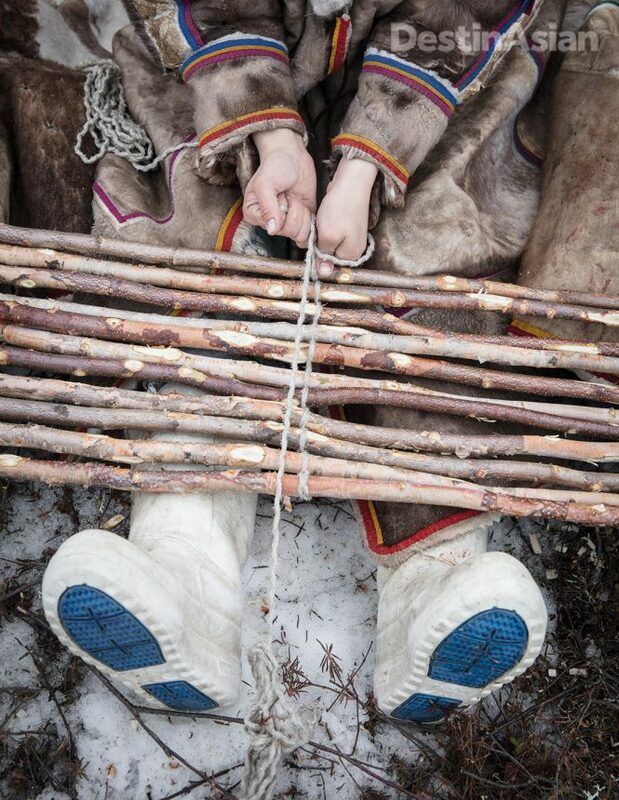 It is said that when Nenets children are very young, their mothers tie them to a stick planted in the snow to keep them out of trouble. When the children eventually learn how to free themselves (well before the age of three, judging by Marianna), they are considered old enough to take care of themselves and allowed to come and go from the chum as they please. That might sound harsh, but it teaches the independence and self-reliance that’s critical for surviving in the Arctic. And while our hosts are mostly aloof with me and the other Secret Compass guests, they slowly thaw. One late morning, as we’re sucking up the last sips of the day’s second tea, Alexey looks at me and jokes, “You better get back to chopping. You might not finish before dark.” It’s as if he’s freed me from my stick. A few days into our stay, Alexey must round up the reindeer for our first migration. He asks if Jen, Zhenya, and I want to come. When we agree, he hooks up a box sledge behind his snowmobile for us to ride in. The slate sky sputters snow and the wind chill is fierce, yet we’re snug in our voluminous Nenets furs: knee-length, hooded pullovers for men called malitsa and longer, lace-front versions for women called yagushka. 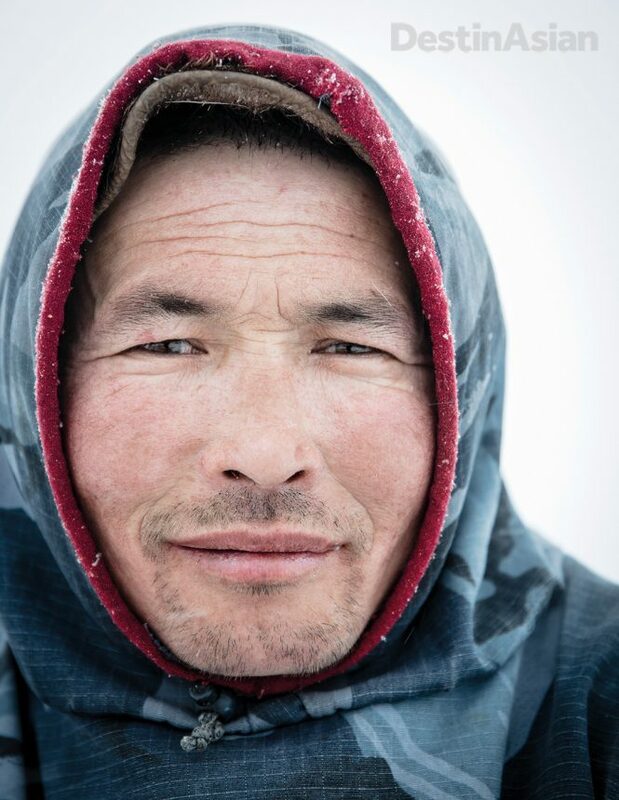 Alexey says that in the old days, before snowmobiles made it easy to travel long distances between the camp and the herds, the men would sleep out on the wintry tundra with nothing but malitsas for protection. A moment of rest with the herd. Photo by Jen Judge. After half an hour, we come upon a vast herd of reindeer. They’re comical creatures, rooting in the snow with their snouts for lichen and lurching like Labrador puppies with too-big feet when they run. I ask how many there are, and Alexey says 2,500. Maybe 3,500. This ambiguity is common here. Set out on a six-kilometer trip, and 30 minutes later, at a rest break, you’re told nine kilometers remain. Ask five people how many reindeer hides it takes to make a chum, and you get five answers. Now, when I press Alexey for a more precise number, he says with a shrug, “I don’t think about silly details.” The vague answers frustrate my analytical side, but life here focuses on the immediate, the concrete. The deer must be tended, the tents moved and raised. Even the landscape is reductionist: blades of snow white, winter-blackened foliage, a cobalt dome of sky. And as I settle into the routine, the simplicity begins to feel restorative. 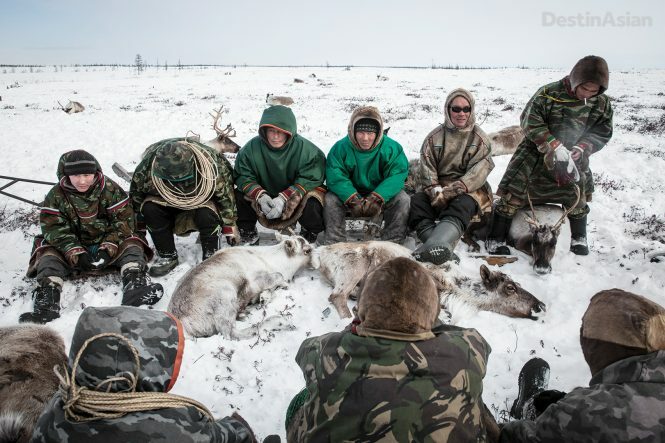 There is some debate over whether to call the Nenets herders or hunter-gatherers. While it’s true they direct their reindeer the way you might stack rocks to divert a river into a side channel, they mostly follow the herd’s natural migration and live off of the animals by selling them for meat in nearby towns. At night, the men herd the deer into an untracked field or meadow; come morning, they return and follow the tracks. 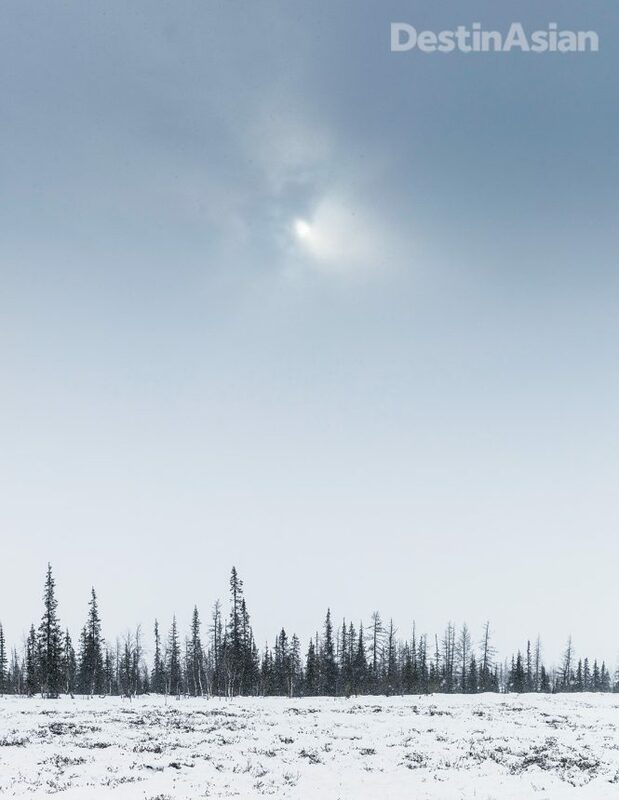 What’s clear is that the Nenets are some of the planet’s last true nomads, on the move for all but a few of the darkest, coldest months of the year. Stitching together willow branches to carpet the floor of a chum. Photo by Jen Judge. Brigade 20 has stayed put for the first three days of our visit, which I gather is to give us time to acclimate. But on day four we break camp. Witnessing this for the first time is startling and exciting, like being at a carnival, but it’s also as complex as a big-city parade. Imagine packing your extended family’s home onto 13 refrigerator-size plywood sledges. Each item has an order in which it’s packed and a precise spot where it’s stowed, down to the way the wash pail fits inside the legs of Rosa’s stool. The sections of our chum’s walls, four in all, weigh 35 to 45 kilos each and must be folded carefully to prevent icing. Even with a predawn start, the packing isn’t finished until midmorning. Afterward, a few herders drive the working reindeer bulls—which are kept separate from the main herd—into a makeshift pen. Each sledge requires around four reindeer to pull it, and by the time the animals are selected and harnessed, another two hours have passed. Nenets women’s traditional winter hoods are weighted in the back with metal pendants to help keep the fur out of the wearer’s eyes. Photo by Jen Judge. 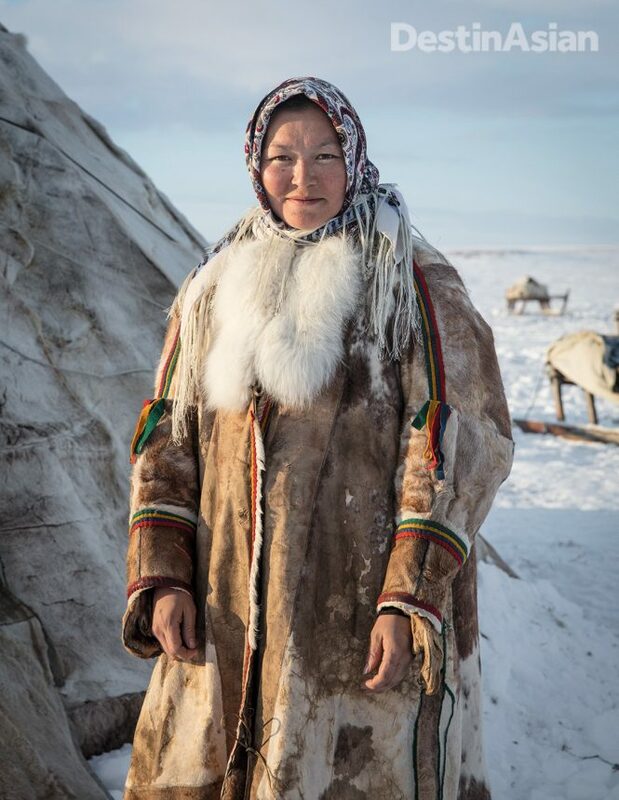 Yet for all the hardships of their nomadic lifestyle, the Nenets are better educated and connected than I would have thought. Russian law says that every citizen must attend school, so starting at age six, the children are sent to the towns. Few make it through high school, however, and instead return to help their families with work. But they come back with good Russian skills, modern tools such as snowmobiles and chainsaws, and, increasingly, computers and cell phones. There is a baffling incongruity to watching people who can turn reindeer bone into tack and timber into tools simultaneously watch DVDs on their laptops. One night, Alexey and Rosa load up a special treat for us: a BBC documentary about the Nenets. They coo with pride at scenes of another brigade erecting their chums and loading their caravans, and they tsk and laugh when one of the men repeatedly misses capturing an animal with his lasso. I can’t help but think that watching the Nenets watch themselves signals the end of an era. Though the crossing of the Gulf of Ob is to be the trip’s crescendo, the most jarring moment comes days earlier, when we witness the slaughter of a reindeer. Most of the animals killed each year are sold to a meat processing plant in Yar-Sale. But the brigade takes a share for meat and hides. When I ask Alexey how many reindeer his family consumes each year, he says, “What we need.” It’s a simple rule to live by. Reindeer on the move. Photo by Jen Judge. In the midmorning, after tea, a few of us are chopping wood and fixing sleds outside the chums when two herders, Pasha and Vassily, drive the working bulls into camp. As the rest of the men encircle the animals with snowmobiles, they split the charge so that a stream of reindeer passes between them. Then they raise their lassos and cast them around the neck of the same animal from opposite sides. 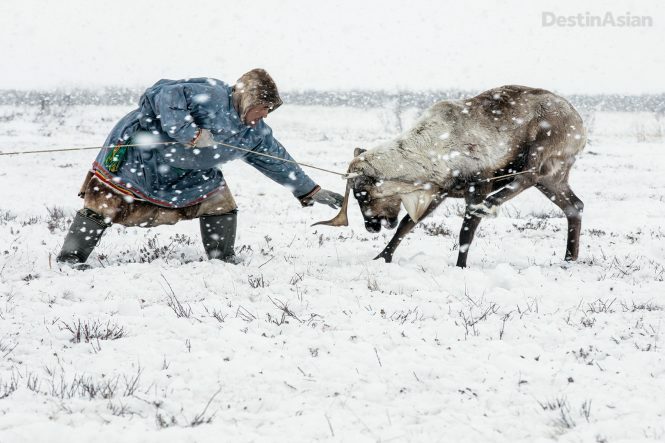 Nenets kill reindeer by strangulation, which preserves the pelt and prevents blood from spilling; it also means we have to watch the poor creature spasm and gasp for almost 10 minutes. When the reindeer finally goes limp, the men clean it, then slash the jugular from within so that blood pools into the body cavity. After sprinkling salt into the viscous garnet soup, Vassily fills a chipped ceramic coffee mug with blood and drinks. The brigade circles like carrion, passing around the mug and knifing gobbets of flesh into their mouths. The butchery is hard to watch, but, in the context of a diet bereft of nutrients, it makes sense. 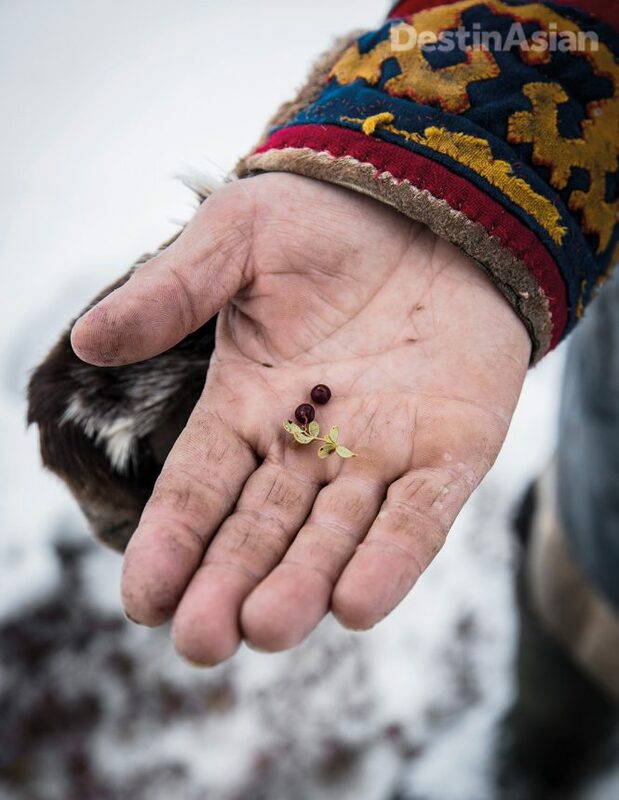 “You feel the life rushing into you when you eat the reindeer,” Rosa says, handing me a piece of dripping meat. 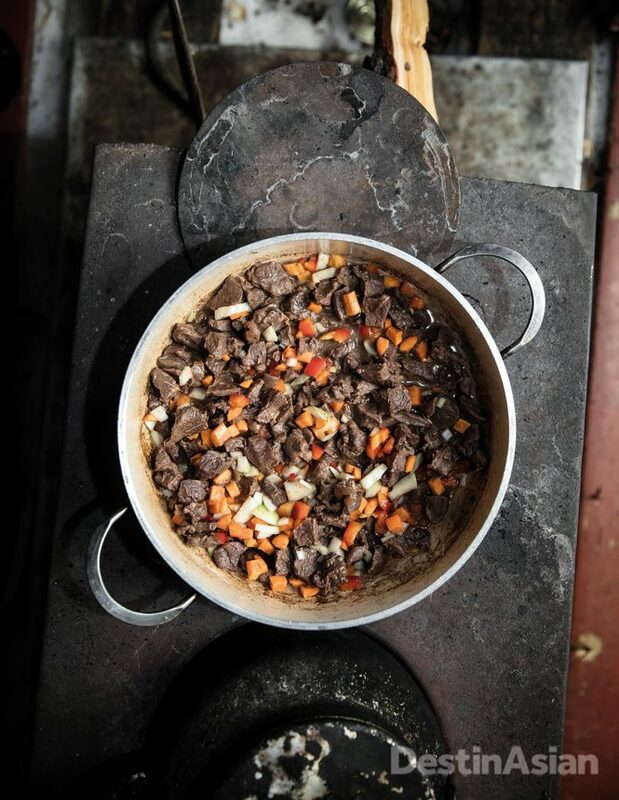 Gnawing on raw venison in the biting cold of a Siberian winter will never top my culinary bucket list. But in a day when globalization is turning the planet as homogenous as suburban America—there’s a Starbucks a block from Moscow’s Red Square—it’s refreshing to have to confront and experience a place on its own terms. 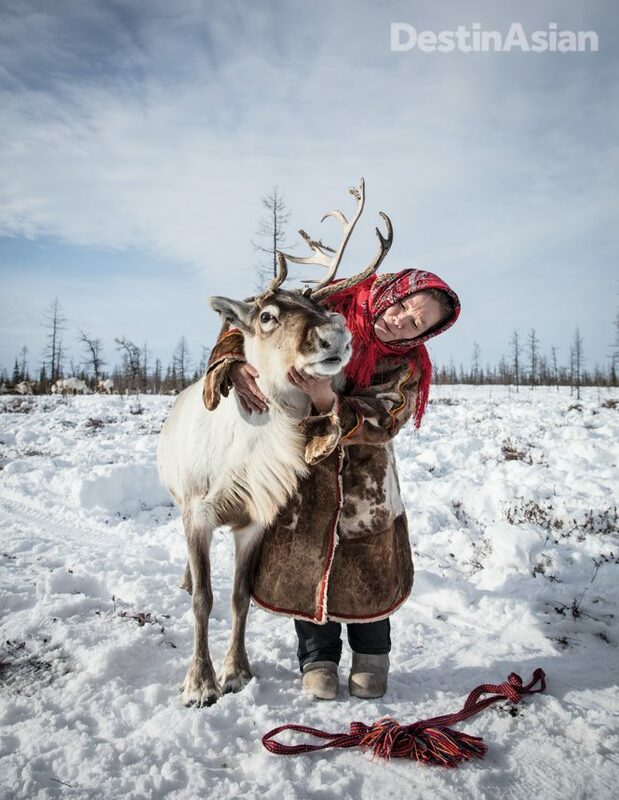 A Nenets woman cuddling her favorite reindeer. Photo by Jen Judge. If travel is meant to challenge and transport, life among the Nenets is the essence of what I chase when I go away. The Siberian tundra is one of the most starkly stunning landscapes left on the planet; it will also kill you with its bleak desolation. 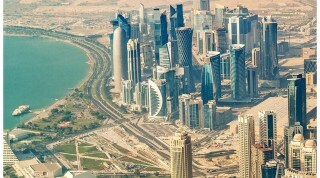 Its people are some of the most self-sufficient and skilled outdoorsmen anywhere, able to live off the land in the most inhospitable of settings, and yet they yearn for the modern conveniences of power tools and connectivity that will simultaneously alleviate their toil and dull their knowledge and skills. To me, the simplicity of existence here feels calming and restorative, yet if I had to live like this every day of the year, it would undoubtedly become as tedious and numbing as office work. Life with the Nenets, just like the chaos of my busy, modern existence back home, is full of contradictions. A snack of frozen whitefish. Photo by Jen Judge. A few days later, on the morning we’re to traverse the frozen gulf, everyone exhales in relief when dawn rises windless, sharp, and bright. The 50-kilometer crossing is three times the distance Nenets usually cover in a day, and on the ice there’s no forage and no escape. Three years ago, a blizzard struck during the migration, and the strafing winds and thick, gauzy snow pinned Alexey, Vassily, and a few others for 48 hours with nothing but their malitsas for cover. Almost a quarter of the herd perished from exposure and starvation. There will be no such calamity today. Wild berries used to make jam and teas. Photo by Jen Judge. Brigade 20 slides down a steep bank and onto the Gulf of Ob like a scene from the Book of Exodus. 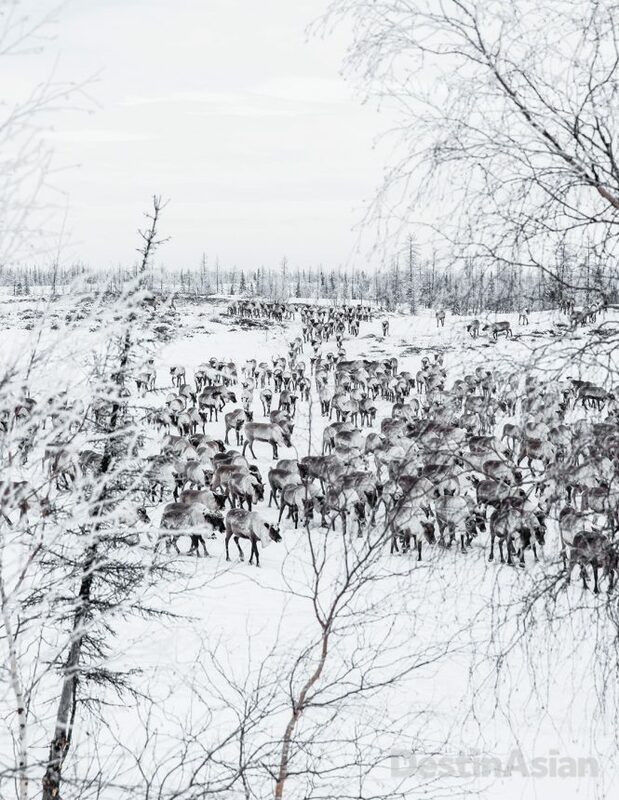 A column of fur-clad nomads, overloaded sledges, and steaming reindeer stretches for two kilo-meters toward the horizon. The ferocious emptiness of the open ice is calming. It’s a frozen desert, with fossil-like shapes cut by the wind into drifts and dunes that stretch out and merge seamlessly into the vast sky. On the back of a sledge driven by a 19-year-old herder named Jarik, I glide toward the shelter of the far-off shore at a pace I could almost walk. The only sounds are the hiss of the wooden runners through the snow and the click of the reindeer hooves like rain slapping a tin roof. For hours, we sit in silence and my mind moves as methodically as the sledge from one uninterrupted thought to another. There’s no churn of silly details. On the tundra, every moment and day feels like one long, smooth exhalation. And, at least for now, I can breathe. Tundra scenery. Photo by Jen Judge. 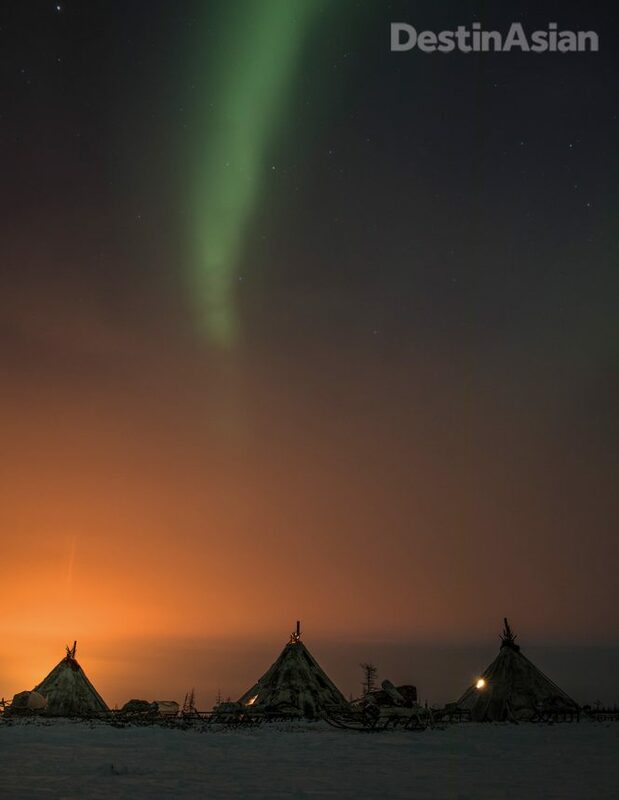 While its third annual “Reindeer Migration with the Nenets” expedition set off on March 25, Secret Compass is already accepting expressions of interest for next year’s 10-day trip. 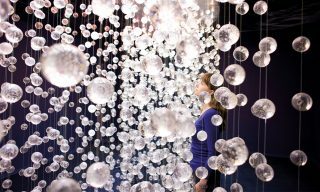 Based on 2018 prices, guests can expect to pay around US$4,825 per person, including domestic flights between Moscow and Salekhard on the Ob River. This article originally appeared in the April/May 2018 print issue of DestinAsian magazine (“Nomad’s Land”).